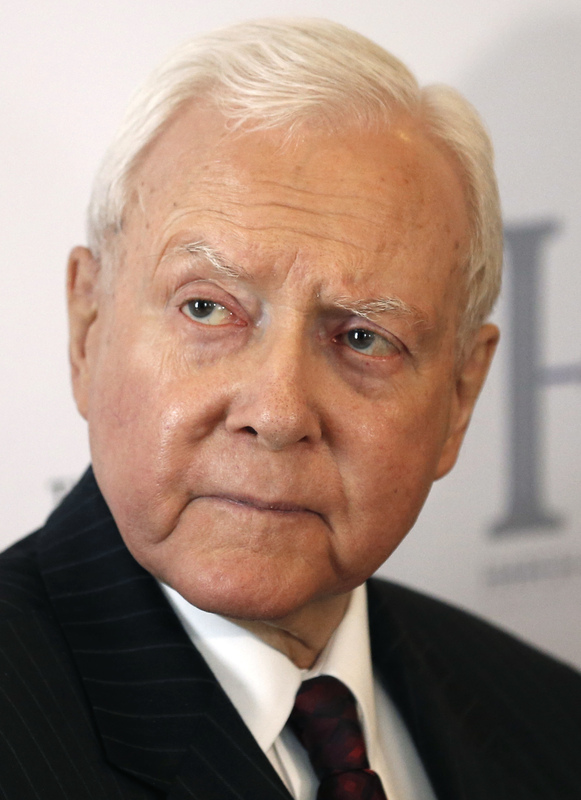 SALT LAKE CITY (AP) — Retiring Republican Sen. Orrin Hatch went before a hometown crowd Thursday to tout his party’s second Supreme Court nominee in as many years and take shots at Democrats who oppose him. Hatch said those on the other side of the aisle have “completely lost their minds,” on Judge Brett Kavanaugh. Democrats worry Kavanaugh would tilt the court right on issues such as women’s access to abortion. He said Democrats are still angry about Hillary Clinton’s loss. “I love the fact that she was beaten, especially by Donald Trump,” he said. Democrats, for their part, complain Bush’s lawyer is selectively releasing documents on an expedited basis without proper oversight. The Senate is planning to vote on Kavanaugh’s nomination in the fall, though Democrats have argued it should wait until after the midterm election. As he prepares to finish a four-decade career in the Senate, Hatch has pledged to do everything in his power to see Kavanaugh confirmed to the high court. If Trump had truly wanted to cause a furor he could have picked a number of people more conservative than Kavanaugh, Hatch told the small group at the conservative Sutherland Institute think tank. He didn’t name any specific alternative, though Utah’s junior Sen. Mike Lee was on the president’s short list. Hatch will retire at the end of this year, and former presidential candidate Mitt Romney is the heavy favorite in the race to replace him. By LINDSAY WHITEHURST, Associated Press. The Democratic party is breaking down. Much akin to the split that occurred with the Republican party 5+ years ago, except their split or fissure is 10x worse. The only rallying point for them is Trump. They have disconnected themselves from 1/2 of the American population completely. Without a center anymore, a lack of trust amongst major factions after the corruption and undermining of the Bernie’ s campaign, all you have that unites them, is a universal hatred of everything Trump. The entire Democratic party is suffering from Trump derangement syndrome, as if hit by a plague. And with that in mind, they have lost morale, and in doing so, continue to further push away 1/2 of the American population, as they cannot see how absurd their behavior has become. They have gone off the deep end and essentially have built a political theology based upon the hope that the President will “surely” be impeached at some point for Russian collusion, or obstruction. Honestly it is sad to see this happen in this country. Hatch says Democrats have ‘completely lost their minds’ . He is so right..
And not a damn word about the disgraceful hypocrisy of Merrick Garland’s treatment by this petty little man. Good riddance. I will not miss you Senator. TDS now being called TAD. But it’s a real malady either way. Keith Olbermann had it bad but he got mental help and no longer posts hate daily from dawn to middle of the night in fact wont mention his name. Rosie on the other hand is in the midst of one of the worst breakdowns. CNN and MSNBC actually aired her this week. Funny if you think pathetic is funny. The Democrats are becoming increasingly crazy as they realized the damage Obama created in just eight years. Trump success is like gasoline on an open fire. Lack of leadership on the left intensifies the anxiety. When your poster child is Michael Moore or Maxine Waters, then you’ve got a problem. A platform of open borders, sanctuary of criminal aliens and assasination of police officers, means you have lost the core of American voters.